August 26, 2013  Muriel "Mickie" Siebert died on Saturday at the age of 80. Siebert, a well-known figure on Wall Street, was the first woman to buy a seat on the New York Stock Exchange. In 1969, she founded her own brokerage firm, Muriel Siebert & Company. August 23, 2013  After decades supplying the American consumer with every import imaginable, Wal-Mart now says it wants to stock its shelves with more goods made in the U.S. In Orlando Thursday, the giant retailer sponsored a conference aimed at encouraging U.S. companies to bring their production back home. August 21, 2013  A group of 20 companies, meeting in Chicago Tuesday, announced steps to implement a safety plan for factories in Bangladesh. The companies, including Wal-Mart, Costco and Gap, formed the Alliance for Bangladesh Worker Safety, which promises to have fire and building safety standards in place by mid-September. August 14, 2013  Federal prosecutors filed criminal charges on Wednesday against two JPMorgan Chase traders involved in the "London Whale" bets that produced $6 billion in losses for the bank. The Securities and Exchange Commission also filed a civil case. The two men were charged with fraud and conspiracy to falsify books and records. August 13, 2013  William Ackman, a controversial hedge fund manager, has resigned from the board of the J.C. Penney Company. Ackman is Penny's largest shareholder and had been engaged in a public dispute with the board over who should lead the struggling retailer. 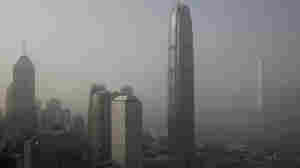 August 12, 2013  Years of rapid industrial expansion have left many parts of China contending with thick smog and dirty water. The move comes at a time when China is trying to shift away from the investment-led economic model that has generated such dizzying growth in recent years, but the global economic downturn has made the transition a lot more challenging. July 26, 2013  U.S. officials filed criminal charges against SAC Capital on Thursday. SAC is one of the country's biggest and most successful hedge fund companies. Federal prosecutors say the firm not only tolerated insider trading, it encouraged it. And they say the firm's billionaire founder, Steven Cohen, routinely chose to look the other way. July 25, 2013  Federal prosecutors finally brought their case against SAC Capital, the giant hedge fund that for years has outperformed almost all of its competitors. Prosecutors say they know why. The firm encouraged the use of illegal insider information and trading on that information became a part of the firm's culture, according to the indictment. July 23, 2013  Last week the Securities and Exchange Commission (SEC) accused SAC founder, Steven Cohen of negligence. The complaint alleges Cohen failed to supervise employees the SEC believes were engaged in insider trading. On Tuesday, Cohen and SAC fired back. July 22, 2013  GlaxoSmithKline officials have admitted that some of the pharmaceutical company's top executives in China may have violated Chinese laws. Beijing has accused the company of engaging in a wide-ranging bribery scheme to boost sales and profits in the country. The company said it is cooperating with the investigation. July 22, 2013  Voters in Japan handed a big victory to the ruling party in parliamentary elections Sunday. It's a vote of confidence in Prime Minister Shinzo Abe's ambitious economic agenda, which goes by the name of Abenomics. Abe has pledged to stir up Japan's moribund economy, but it will mean challenging some entrenched interests. July 17, 2013  Five years after the start of the financial crisis, the U.S. banking industry continues to earn strong profits. On Tuesday, Goldman Sachs became the latest big bank to report better than expected earnings. But rising interest rates mean a riskier environment for banks. July 15, 2013  Three years ago the Securities and Exchange Commission filed civil charges against Goldman Sachs and one of its traders, Fabrice Tourre. They were charged with misleading investors over mortgage-backed securities. Goldman settled and agreed to pay $550 million. Tourre's trial began Monday in a Manhattan court room. July 10, 2013  Wal-Mart and Gap joined a Bangladesh factory safety group and were immediately criticized for not joining a more stringent pact made up of mostly European retailers. Wal-Mart says the agreement requires the inspection of all subcontractor factories within a year.